Hyannis Harbor Light (also known as South Hyannis Light), is not often visited by most tourists. The lighthouse and keeper’s house have been changed so often over its lifetime that it looks very different today than it did back when it was built in 1848. In the 19th century, Hyannis needed a lighthouse as the fishing and trade port became increasingly busy. 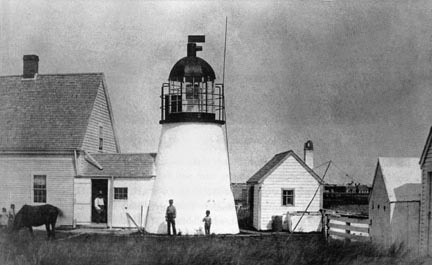 The first Hyannis Harbor Lighthouse was a privately-built shack (nicknamed “The Bug”) with a lamp that hung in a window, owned and maintained by Daniel Snow Hallett and his son- also named Daniel. In 1848, South Hyannis got its official lighthouse to warn mariners away from the Southwest Shoal. A house for the Keeper to live in, followed 2 years later. Before long, a total of 1,400 schooners and 100 steamers were arriving in Hyannis per year and that number rose even higher in subsequent years. In 1885, a lamp light was hoisted to the top of a 20-foot wooden tower on the nearby Old Colony Railroad Wharf. Mariners would line up the new range light and the lighthouse, as a guide into Hyannis Harbor. A 1922 inspection showed a kerosene-fueled lamp and a fifth order Fresnel lens, had been installed. Access to the station was only from a road into town. The keeper had no boat and there was no landing place for a boat other than a small beach. Waldo Leighton was the last keeper of the lighthouse, moving to Nobska Point Light in Woods Hole when the Harbor Light was discontinued in 1929. The closing of the light station came about because the main ship landing site in the area was moved to Lewis Bay. The entire lantern room was removed from the lighthouse, while the range light continued as an single acetylene gas beacon. The Hyannis Harbor Light was auctioned off and has been sold several times over the years. The old keeper’s house has also been dramatically changed and expanded over time. After purchasing the lighthouse in 1985, the present owners, Janice Hyland and Alan Granby, built a new top for the tower. The new and improved lantern room overs wonderful panoramic views of Nantucket Sound.